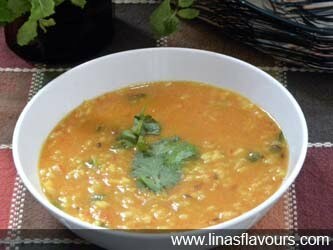 Soak moong dal for about 50-60 minutes. Add 2 glass of water and pressure cook it for one whistle. Add 1/2 glass of water to tomatoes and make tomato puree. Take a pan and heat ghee. Add cumin seeds, asafoetida, spring onion and stir it. Add ginger-garlic paste, green chillies and cook it for about a minute. Add tomato puree, salt, red chilly powder, turmeric powder and mix it well. Cook it about 2 minutes. Add boiled dal (with water) and cook it for about 2 more minutes. Add more water if you want thin consistency. Garnish it with coriander leaves and serve it with rice, roti or paratha.